Over the past couple of weeks, we've seen American bands remake "Cat's In The Cradle" and "Mrs Robinson" in early '90s rock style. This week in 1993, the triumvirate of covers was completed by another update of a hit from decades past. 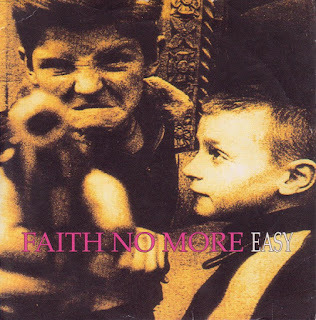 And like the Ugly Kid Joe remake, this new cover would go on to reach the number 1 spot on the ARIA singles chart - the second time the band in question reached the top, although this remake was nothing like the song they'd reached number 1 with back in 1990. The number 1 song this week in 1993 was still "You Don't Treat Me No Good" by Sonia Dada, but with two future chart-toppers queuing up behind, its days on top were numbered. This final single from the Love Symbol album was a chart disappointment around the world, missing the Australian, US and UK top 40s. A couple of months later, Prince would change his name to that same unpronounceable symbol. This jaunty follow-up to breakthrough single "Happy Birthday Helen" was unlucky not to become a hit, kept waiting on the threshold of the top 50 for two straight weeks. As "Jump" spent its 19th week in the top 50, this irritating second single from dance act The Movement based on the nursery rhyme thankfully didn't match its predecessor's success. Since their name change from Killing Time, rock band Mantissa hadn't been able to land another hit. This single would be their final top 100 appearance, although they continued recording and touring until 1996. Somewhere along the way during Depeche Mode's transformation from slick synthpop group to stadium-filling synth rockers, Australia had lost interest in the band we'd once sent into the top 5 with "Just Can't Get Enough". Not even 1990's Violator album, despite all its international success, made waves locally. Things changed with their eighth studio album, Songs Of Faith And Devotion, which not only saw the band breach the albums top 20 for the first time, but returned them to the singles top 50 following a nine-year absence since 1984's "People Are People". 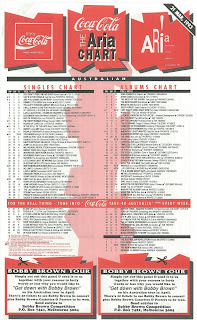 The song that did it was lead single "I Feel You", a synth-meets-rock anthem that burst from the speakers and was a world away from the sound most Australian fans would've associated them with. Whether it was the rockier vibe that appealed to Australians or the fact that both "I Feel You" and the accompanying album were among the best work the band had ever produced, I'm not sure, but as a result of the improvement in their profile, Depeche Mode undertook their first major tour of Australia the following year - and I slept out overnight for tickets, having fully embraced my love for the band with this album. Her solo career had got off to a good start with top 20 single "Why" and the Diva album debuting inside the top 10, but any hope that Annie Lennox would be as consistently successful as Eurythmics had been throughout the '80s were dashed when both "Precious" and "Walking On Broken Glass" fell short of the top 50. Things took a turn for the better when easily the best song from the album was finally released as a single and she returned to the top 50. With its career-referencing music video, featuring a host of doppelgängers dressed in Annie's most memorable looks, and a new track as a double A-side - "Love Song For A Vampire" from the Dracula soundtrack - it had everything going for it, but still somehow only just crept into the top 40. 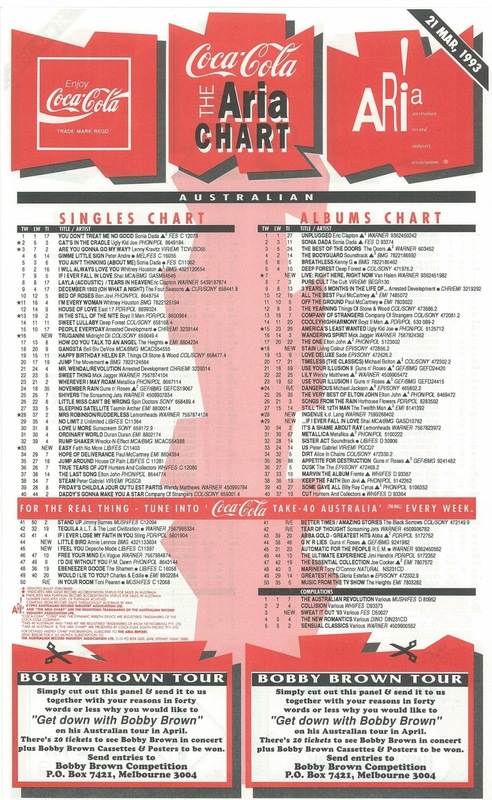 Despite sounding nothing like what we'd come to expect from Faith No More, this reworking of Commodores' 1977 US and UK top 10 hit - it reached number 75 in Australia - wasn't completely out of the blue. The band had been performing the song in concert and recorded their fairly faithful version during the sessions for the Angel Dust album. Eventually added to the tracklisting for the album, it became its final single - and its biggest by some margin. Although "Epic" had given Faith No More a number 1 single in 1990, that song's massive success had so far been a one-off in Australia, with the band settling in to a series of modest chart achievements ever since, clearly appealing to a more niche audience. But just as "Easy" had been part of Commodores evolution from soul/funk band to adult contemporary crowd pleasers, so too did the cruisy tune provide Faith No More with an opportunity to once again reach a wider fanbase. Here's a band who'd enjoyed an incredibly large fanbase in Australia for about a decade, and this lead single from eighth studio album Earth And Sun And Moon maintained that, giving Midnight Oil their first top 10 single since 1990's "Blue Sky Mine". Named after an Indigenous woman from Tasmania whose story you can read here, the song also touched on the republican movement in Australia and the socio-economic problems facing the country. "Truganini" would turn out to be Midnight Oil's final major hit, with no further singles reaching the ARIA top 20. It seems their days of shifting truckloads of albums were also behind them, with Earth And Sun And Moon failing to match the chart-topping status of Blue Sky Mining and Diesel And Dust (although it did get to number 2), and selling a fraction of what those albums did. Next week: the sixth and seventh singles from a 16-month old album by a music superstar debut in the same week, while the latest hit by another megastar also arrives. Plus, the first ARIA chart appearances by a multiple Grammy Award-winning Canadian singer/songwriter and a local rock band that'd go on to dominate the 1994 ARIA Awards. Faith No More's "Easy" is still one of my favourites, and I'm glad it matched the number 1 peak of "Epic". I bought the single in a second-hand CD shop in 1998 (it continued the band's tradition of completely random meaningless cover art) after Triple J played one of the B-sides: a weird synthesized polka sung entirely in German called "Das Schützenfest". One of FNM's best. I played it really loud in one of the lecture theaters at uni…good times. I don't think I'd heard 'B.I.N.G.O.' before. I've been waiting to tell this story here for a few years... Brace yourselves ;-) It involves my purchase of Annie Lennox's 'Little Bird'/'Love Song For a Vampire' CD single. Well, after several months of unsuccessfully looking for the 'Love Song For a Vampire' single (rage and Video Hits both aired the video in December '92), and seeing it wasn't on the 'Diva' album, *finally* I found a copy in my then-local JB Hi-Fi one Saturday. 'Twas also the day of the 1993 federal election, I remember. Anyway, when I took the single (the only copy they had) to the counter to pay for it, the nice sales assistant behind the counter asked me if they had any other copies of it on the racks, and I told her no, 'cause they didn't. She then offered to BUY it off me! Ha ha! I refused. I hope she managed to find a copy later on; I feel slightly bad about it now, I mean, I could have easily gotten a copy of it somewhere else eventually. But how funny (at least I think), being propositioned with an offer to buy the thing you're buying in a store by one of the people who work there. Now, as for 'Little Bird', I like it, and the video was quite novel at the time (I somehow didn't realise initially that the other 'Annie's were drag queens; though thought the 'Thorn In My Side' one looked a little off)... but it's no 'Love Song...'. I remember thinking Dave Gahan looked slightly crazy in the 'I Feel You' video, and, given how his life would unravel over the next few years, I wasn't wrong! I like the song, but they've had much better. Wow at sleeping out overnight. I was such a fan of the Annie Lennox song "Little Bird" that I can't believe it's taken until now to see the film clip. She did well to film that being 7 months pregnant at the time. You can only just tell as the black costume hides it well. I was so hoping to would do better on the charts. Things of Stone and Wood's song "Rock this Boat" was also high on my playlist at the time. Aah good times.